Custom maps app My Maps for Android has received an update from Google that gives the app "a new look and feel." Google says that the app has been rebuilt from scratch. With My Maps, you can make a custom map to keep track of places that mean a lot to you. You can even use the app to place a pin exactly on your current location. With the update, many of the places you map will have a Street View look of the area, so you can see what it looks like for real. You will be able to view videos and photos that have been added to the web, and get directions to points on the maps that you've saved. And when you start to map your favorite places, you can add new locations to the map right from the app. There is no need to start a brand new one, although you could if you wanted to. Don't confuse this app with Google Maps. But that doesn't mean it can't come in handy. If you have friends or family coming into town, you can make a map of the places where you like to go, add other places that you recommend, and send it to them as a virtual tour that they can take of the area. 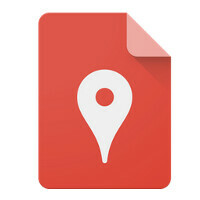 My Maps is a free download from the Google Play Store. You can install it by clicking on the sourcelink. Is this supposed to replace My Tracks? No, My Maps is an app where you can basically drop a bunch of pins on a map. I used it once to plan a driving route for a vacation. No it's supposed to give Google more data on you so they can exploit I mean deliver relevant advertising to users whether they like it or not.